After many months of waiting for our first ever 2 day game the day duly arrived. Unfortunately due to the match falling on working days getting a team together proved to be a struggle. After using all options and sources our guests included Sam from Pacific , Dave from Oxshott , Dan from Dulwich and Husnain from HSBK. The Roehampton pitch is tucked away in a picturesque copse with the clubhouse located a 2 minute walk away. The pitch is a real belter and a lot depended on who won the toss. Unfortunately we lost and to nobody’s surprise we were fielding in 30+ heat and relentless sun. When Sam had Ben,their opener, LBW for a duck Graces tails were up. Nick the other opener has a similar style to Jonners in that he can drop anchor and let the other bat take up the attack and so it proved as Rob (one of 4 PE teachers!) played really well flaying anything wide to the boundary – as the outfield was brown and super quick the ball seemed to accelerate away from Graces fielders. 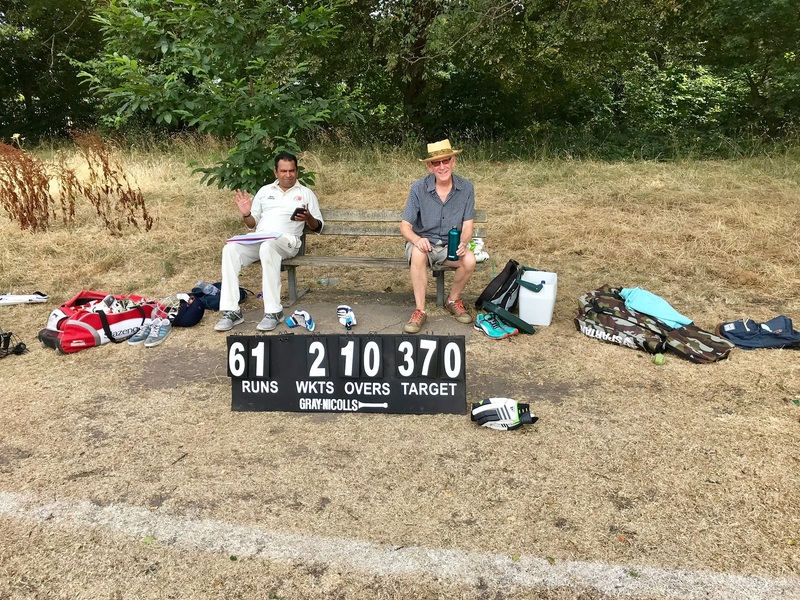 His 50 came up quickly as we did a lot of chasing – Mendis finally ran him out with a great throw and when keeper Jonners caught Nick shortly after our hosts were 82 for 3 and we thought we were in with a sniff. Sadly it was not to be as Bats number 4 Ed and 5 Sam then took advantage of the super flat wicket and accelerated the scoring rate away leaving Graces to toil in the sapping heat. Our heads never went down as guests Sam and Dan and Husnain bowled well. Dave sharing keeping roles with Jonners showed that he’s a smart keeper. When Husnain bowled Sam for 57 the Bats had reached 274 for 4 and we were really looking at damage limitation as the pitch was giving nothing to the bowlers. Ed went on to make a fine unbeaten century and a late clatter of wickets as the Bats looked to declare which they duly did at a formidable 328 for 7 after 62 overs. Fielding in 30+ degrees with a cloudless sky was really draining and frequent drinks breaks were taken. Lunch and tea were taken in Roehampton CC’s cosy clubhouse. Husnain and Jonners opened for us and after a lovely pull for 4 Husnain played over one and was bowled for 4. He then promptly walked off to sit on a bench with apparently his dad – he’d come all the way from Chigwell to play for us. He then stayed on this bench for the rest of the day! Dan in at 3 hit a brisk 25 before getting an edge to be caught and bowled for 25 – 31 for 2. Jonners had been playing patiently but when a wide delivery appeared a rush of blood resulted in a mistimed shot caught in the covers – 35 for 3. 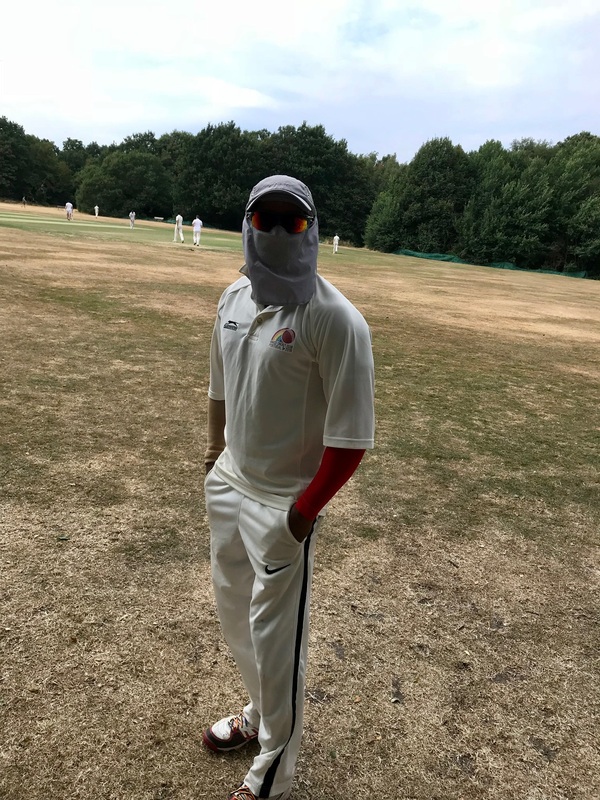 Menis in at 5 looked comfortable , skipper Mahender edged behind for 4 and when Mendis was smartly caught in the covers for 32 our score was 90 for 5 – the Bats total seemed a long way off! Stuart and Manish looked to rebuild our innings and looked comfortable until Stuart managed to pick out square leg for an entertaining 36. Guest Dave in at 8 showed his batting class as he then took the attack to the Bats with an attacking range of drives and pulls taking the score to 165 before Manish was caught for 15. Sam and Ronnie supported Dave taking our score to 188 with Dave finishing on a stylish 61 not out. So a deficit of 140. Both teams then retired to the clubhouse for a much needed beer , BBQ and an egg throwing competition! So onto day 2 – It was going to be 100 overs maximum. Our numbers were reduced when Husnain contacted us to say he’d broken his arm! (also Stuart and Dan could only play Thursday) However on Thursday a stocky Aussie , Andrew , had wandered past and asked about the game – numbers were exchanged and he duly turned up on Friday to help us out! A nephew of one of the Bats , Charlies , was roped into play for us and Newton was expected at about 2.30. 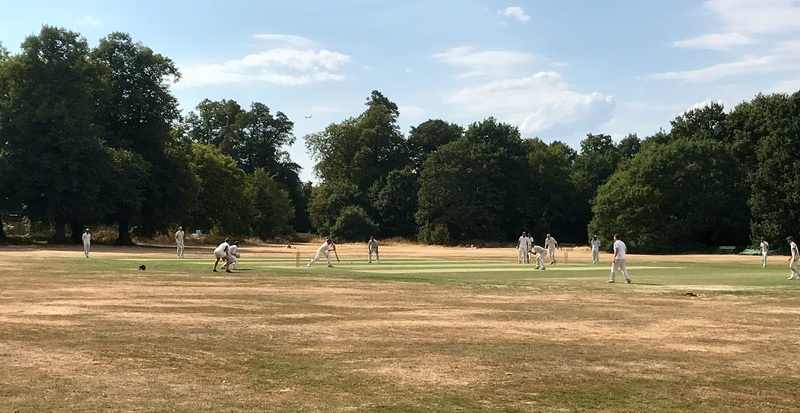 Our hosts unfortunately carried on from Thursday with a rapid run rate – a chance free 100 opening partnership left us again chasing the ball to all parts of the field. The Bats eventually declared after 38 overs on 230 for 7 – Dave taking 3 stumpings as our hosts looked for quick risky runs. Mahender took 3 wickets. Jonners in at 6 then joined Dave. It’s not often Graces batsman are on a pair and Jonners (well aware of this unwanted statistic!) cautiously waited for a lose ball before hitting a boundary – relief! With the weight off his shoulders he then enjoyed supporting Dave , who continued with his great attacking shots from the first innings. The Bats then started to feel the heat as a wicket wasn’t forthcoming and a lot of chasing was necessary. This partnership lasted for 19 (frustrating for our hosts) overs before Dave’s first error of the match left him caught behind for 48. 224 for 5 after 42 overs. Newton had arrived and joined Jonners with only 20 overs left to negotiate. Jonners then supported once more while Newton enjoyed the flat track hitting anything lose to the boundary. Newton was caught for a fine 55 bringing in Manish in – he looked untroubled as ever. Jonner’s marathon stay eventually ended when he edged to the keeper for 17 – 252 for 7 after 54 overs. So we had 8 overs to negotiate to force a draw – Sam batted well until he dragged a ball onto his stumps for 10 bringing last man Ronnie in. Ronnie had damaged his hand fielding and batted in some discomfort. His batting (and bowling) has really come on this season and stayed with Manish until getting bowled in the 59th over. After our stubborn batting performance our hosts were delighted with their win – we were so close to a draw! 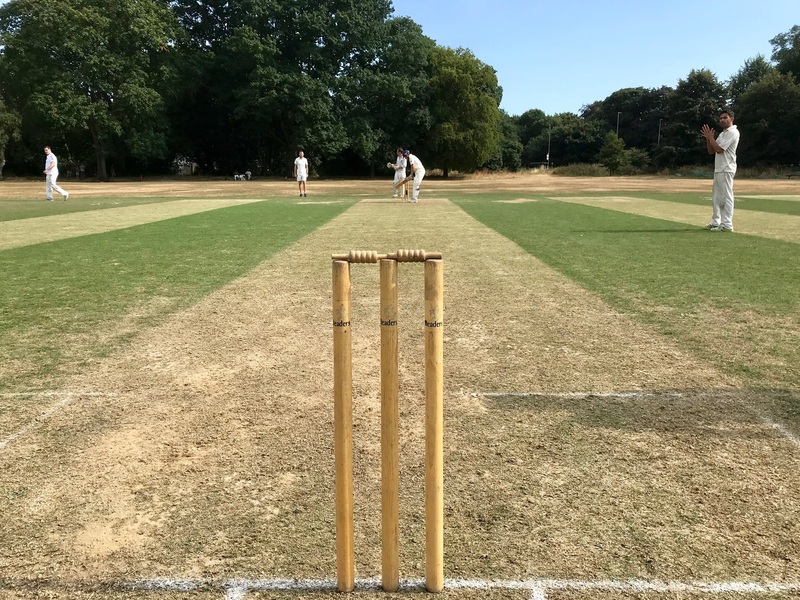 So our first ever two day game turned out to be really close – The Bats were on top for most of the sessions and helped us out when we were short of 11. They are definitely one of our favourite teams with fab hospitality and a great attitude. A big thanks to all our guest players without which we couldn’t have played. Next time we should try for a Saturday / Sunday 2 day game to help with availability.